When I'm on the go, my favorite go-to-snack is a Yogurt Honey Peanut Balance Bar. I love the taste. It's only 200 calories and has 15 grams of protein. It's basically perfect. But both G and I eat them during the week and the cost starts to add up. When it's not on sale, some weeks I can spend close to $20.00 on a bunch of them. As someone who knows how to bake, I've started to wonder if I could hack the recipe. I'm not even close and there would be the downside of not knowing the exact protein and calorie amounts, but I've decided that I need to supplement this delicious snack with something else when I can. I love granola, so I looked for some recipes and found one for Blueberry Vanilla Greek Yogurt Granola Bars. I went so far off course while adapting that it's not even close to being the same recipe, but it was a nice place to begin. I used dried cranberries instead of blueberries. The mixture was only supposed to be frozen and I baked it. I used leftover vanilla frosting and mixed it with vanilla yogurt for the topping, but poured it on top of the mixture in the pan and baked it right in instead of the dipping and overnight drying out. I know myself and the overnight drying is not something that I'm willing to do on a regular basis. Plus, I tried freezing the mixture and I was just not into the texture or that method. Brown rice krispies aren't something that I buy, but I do save the leftover smashed cereal bits from boxes of cereal and used that in its place. I used flax seeds instead of chia seeds. I had sweetened shredded coconut not unsweetened. I added more peanut butter and more honey as well. 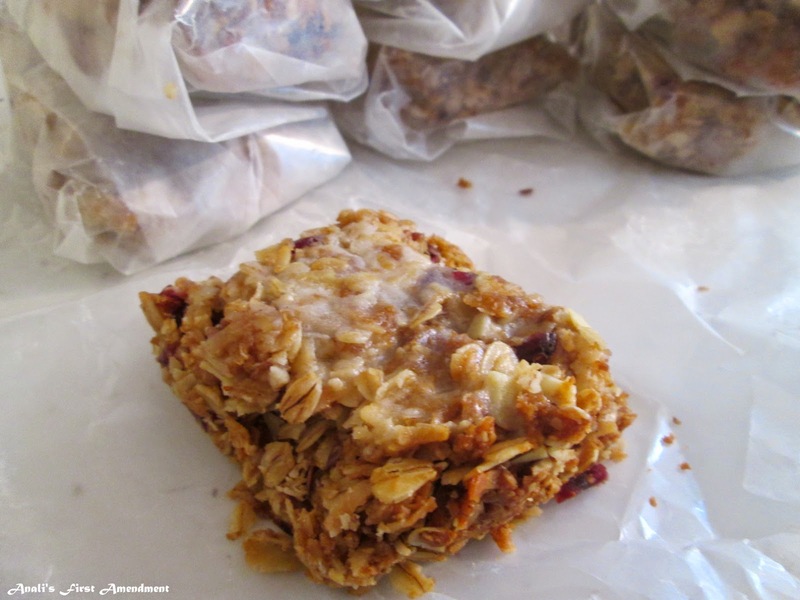 These granola bars are so good! But they are too sweet and need more work. I didn't write down what I did, but I have a better idea of the taste and texture that I'm looking for. The recipe adaptation continues! Hope you're enjoying the long weekend and your Memorial Day!